The American mid-1944 campaign in the Mariana Islands was an important strategic step that placed Tokyo and the rest of Japan’s industrial heartland within range of the new U.S. Army Air Forces B-29 very-long-range bombers. Once the islands were secured and the airfields were built, the army air forces in the Pacific could do to Japanese industry what their counterparts in Europe had been doing to German industry since mid-1943. The first and most difficult objective in the Marianas was Saipan, a former German colony that had been in Japanese hands since the end of World War I but had not been fortified in any meaningful way until the spring of 1944. By early June, despite effective interference from U.S. Navy submarines, the island was defended by approximately thirty-one thousand combat troops of varying quality and in various states of readiness. Squaring off against the defenders were two battle-hardened Marine divisions, each numbering about twenty thousand troops and supported by an array of twelve combat, combat support, and service battalions, not to mention ample carrier air support and U.S. Navy warships. 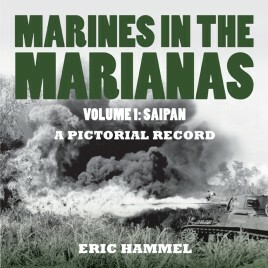 Relying mainly on 290 gripping photos gleaned from government archives, many with extended captions, veteran military history author Eric Hammel has created a stunning and coherent battle history dedicated to the memory of the United States Marines who endured the bloody campaign to secure Saipan from its stubborn defenders.